3M Diamond Grade Series 997 are highly retroreflective microprismatic, edge sealed films with excellent angularity providing enhanced visibility and detection of vehicles. Ideal for curtain-sides and flexible surfaces such as coated curtains. ECE104 Compliant. *Up to 3 years outdoor durability. A truck with outline reflective markings is recognised earlier than an unmarked truck, giving other drivers more time to manoeuvre safely thus reducing the chance of an accident by up to 30 times. 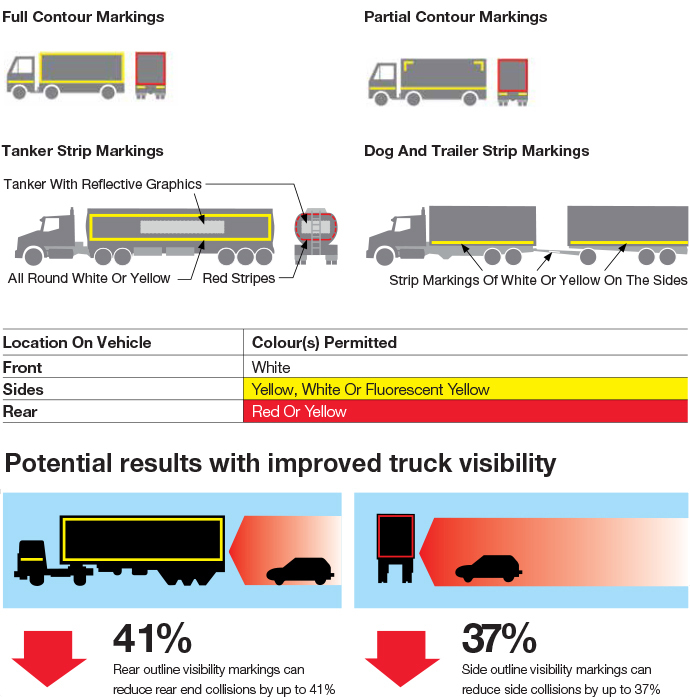 3M offers a complete range of ECE104-compliant reflective tapes for marking rigid and curtain sided heavy vehicles. These products provide outstanding reflectivity and durability, are easy to apply, and backed by 3M's technical and customer service.